I emigrated to Canada in the spring of 1964, arriving in Montreal on May 6 after a voyage of seven days. Although I never did find out all the salient details, I was informed around Christmas 1963 that we were moving to Canada. At this point I was halfway into my first year of secondary school in Yorkshire, in the north of England. My father apparently had tired of rainy England and procured a job in Toronto, and he flew out in February 1964, to stay with the sister of a neighbour of my maternal grandmother. Mum was left with the job of selling the house and most of the contents, car, etc. By mid-April this was accomplished and we left the house for the last time in a taxi to the station on our way to Derby to stay with my grandmother until our sailing on April 28. This was very interesting and exciting for a twelve year old boy. The only thing I regretted was leaving my school and friends. Mum must have felt sorry for me and acquired tickets for a special steam train excursion from Derby to Crewe, including tours of the railway shops. On the morning of April 28 we boarded a train for Liverpool, and found our way to the big CP ship, which was at the time, I believe, berthed at Gladstone dock. The ship was very impressive, and loomed large at the dock as we were processed through the ticket agents and customs inspection, then walking the gangway onto the huge vessel, then finding our way to the tiny cabin on B deck. As mum unpacked and then took a nap before dinner I set out on an exploratory mission of the ship, picking up a few friends here and there, mostly emigrating to Canada as I was. The first night was smooth and peaceful, and we awoke next morning anchored in the Firth of Clyde to pick up more passengers. The rest of the day was spent on deck watching the passing scenery, and then watching the land recede as we made our way toward open ocean. The next five days were spent exploring all the ship's amenities, including the small theatre, deck games, and of course many hours just walking the decks with my friends. I can still see hear and smell the ocean spray from the stern of the ship. Finally we encountered land as we passed PEI, the Gaspe peninsula, and entered the St Lawrence Seaway. I remember it was hot and sunny, a distinct contrast to cold rainy Liverpool, and was marvellous sitting on the deck watching the scenery drift by on either side of the ship. On May 5 we docked in Quebec City, where we disembarked to process through Canadian Customs and Immigration. I was now a landed immigrant. After this we had most of the day to explore, and conveniently a hoard of taxis arrived to take us on tours. Then back on the ship one final night, waking up in Montreal. We had booked train travel to Toronto, leaving that afternoon, so in the meantime we hopped on a scenic tour bus to see Montreal. It was at the top of Mount Royale that I experienced my first real hotdog, priced ten cents. It was so good I must have eaten at least six. Then to the train station and onto the train. It was slow but comfortable, the onboard sandwiches were expensive but we didn't have much of an idea how much things cost. After what seemed like many hours we arrived in Toronto very late at night, to be met by dad and Elsie and Ray. Dad had found a modern apartment in the west end, and I collapsed into bed, my head spinning trying to comprehend that I had just travelled about one third way around the globe. As the last large net full of baggage was swung aboard and the lines thrown ashore, the Royal Liver building's clock showed 4:20 pm, it was Monday, October 12, 1969. Exciting! especially as we screamed that our portmanteau was being left as the only piece of luggage on the dock. Fortunately our shouts resulted in a seaman dragging the item up the gangplank. We did not stop in Scotland and the following morning found us out of sight of Ireland, sailing west. That day the seas became angry as we sailed through the remnants of a gale, or so we were told, some remnants. Huge waves, so that one minute the sky was visible through the lounge window, the next the horizon was just visible then next just the sea. The Dr. did a roaring trade with the command "drop your drawers" for a 15 shillings a jab. It did not help that the ships stabilizers were not working so the ship wallowed like a large rowing boat. Dinner plates slid to the floor so only sandwiches were severed, and drinks, if they made it to the table, survived due to being placed in what could have been called large inkwells. It was without doubt a memorable crossing. The seas became calmer and on Friday evening I picked up on my transistor radio that K-Mart (whatever that was) in St. Anthony were having a $1.25 day. We continued down the St. Lawrence passing Anticosti Isle in the rain and on to Quebec City. What a fantastic site as we passed under the high tension electricity lines there were the ramparts leading to The Plains of Abraham. Immigration and Customs checks on a sunny Sunday afternoon and then we were free to roam lower town Quebec City. Rue Champlain shops were interesting with frozen puddles in the street and my wife asking where had I brought her? It was 23 degrees F. We sailed overnight to Montreal and disembarkation. It seems just like yesterday not 50 years ago this coming October. I believe we were on the penultimate voyage of the Empress of England before it was sold for 5 million pounds to begin round-the-world-cruising. I trust they fixed the stabilizers. My mother, two younger sisters and I sailed on the Empress of England Sept 11, 1961. We set out from Belfast Northern Ireland and boarded the ship in Liverpool. My mother was only 23, I was 5 and my sisters were 2 and 8 Months. I can’t even imagine how hard and overwhelming it must have been. My mom had never been away from her family and now we were headed for a strange country where we knew only my aunt, my dads Sister. I wish I could remember more of the trip. The only real memory I have is of the strong, sickly sweet and foreign smell of apple juice. It was not something we had ever had and to this day I can’t stand the smell of it. It was so strong because there was so much of. It prepoured into little glasses when we entered the dining room for breakfast. At one point, my mom had sea sickness and had to be knocked out for 24 hours to recover. I have no idea who looked after us in the interim. We travelled the ocean for a week and landed in Montreal, where my father and uncle met us and all 7 of us drive in a car to Dundas, Ontario. About an 8 hour drive. My family really never left Dundas. I guess that one long journey was enough miles for my parents to travel. My husband Garry and I left Liverpool June 26, 1969 arriving in Montreal July 2, 1969. It was supposed to be an adventure for 2 years then go home and start a family. So, 50 years later here we are still in Montreal blessed with 3 children and 8 grandchildren. We love it and no regrets. Would love to hear from anyone on that voyage as I hardly remember a thing. I did fancy dress and won a pearl necklace which I still own. Bitter sweet memories we have. In 1963 I was 11 years old when my family immigrated to Canada. My dad was already in Vancouver and my mum and four kids travelled by the Empress of Canada from Greenoch to Montreal. I can remember it being a very rough crossing and we spent most of our time in bed sick. We hit two hurricanes and most of the ship was roped off due to the high waves. When we hit the St. Lawrence we were finally able to get out and about. On May 10, 1963 we docked in Quebec City to go through immigration then back on ship to Montreal. From there we hopped on a train to Vancouver to meet up with my dad. The total trip was 10 days, quite a feat for my mum with four young kids. I was 10 years old when we emigrated to Canada 50 years ago. We left from Greenock Scotland June 6 1968. I remember the piper playing Yer no awa tae bide awa on the shore and my granma waving as we left on the tugboat to the ship. Her pink hat stood out in the crowd. Very emotional. The trip was fun for us kids....movie playing was the Lion in Winter one night, swimming in the pool but there was waves in the pool one day so maybe it was a rough day. On the deck we could see the icebergs and at the back of the ship the water chuning. Bot my parents were seasick and the doctor gave them a shot ...my sister and I had to have dinner in the dining room alone but our waiter took great care of us. There was a strike by the dockworkers in Montreal so it took some time to get our belongings. Wonderful memories! Our passports to the. To mail to our homes which they did. 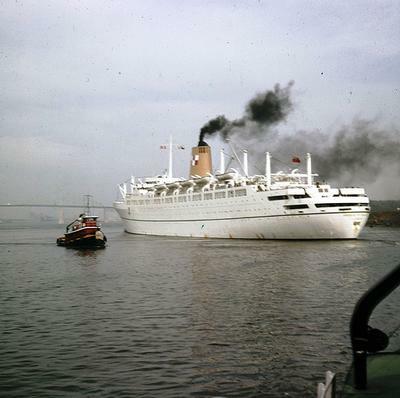 I sailed from Liverpool to Montreal on 26th June 1963 on my way home to Australia via Canada on the "Empress of England"
Life was full on with the 25 hour days . I only had 4 hours sleep per day as there was so much going on. There were 1000 senior Citizens returning from a tour so the 40 or so younger people all arranged to get together on the first night to meet each other and not waste what time we had together. There was a shortage of male dance partners so I was kept very busy on the dance floor. It was here I met a wonderful lady from Calgary who invited me to stay with her on my hitch hiking across to Vancouver. I was welcome with or with out notice and stayed 2 weeks.This friendship has survived 55 years and on a return trip to Canada in 2007 with my wife we were looked after by her daughter. The ship was great and very comfortable and I felt it a pity when re named " The Ocean Monarch' and treated the way it was. That week is etched in my memories. I only hope that the immigrants fared well in their new land. I'm wondering what motivated your families to make such a big move to Canada. Very interesting stories! Thank you for sharing. We emigrated to Canada in June 1964 - one month after you. I was 18. We were headed to Ottawa. I remember they were filming "Ferry Cross the Mersey" as we left, and we were shouting to Gerry Marsden from the deck. I loved Montreal but found Ottawa very boring after Liverpool, so returned six months later and married my boyfriend. We returned to Canada two years later. Ottawa is a vibrant, interesting city now and I am so glad I live here. My three children and eight grandchildren ate all here too. Nostalgic memories! I was only 7 when my family left Watford to take the train to Liverpool to board the HMS Carinthia bound for Montréal. I wasn't old enough to understand a lot of what was going on & couldn't write well enough to record our voyage. I do have my memories though.